We rode until we found a fishing pond to camp beside, the long grass making for a soft bed that night. For such a secluded and quiet spot, there were quite a few cars doing a small tour of the pond, pulling up and having a beer by the water! A storm rolled in overnight and rained on us while we slept. We remembered that last rider we spoke to saying he’d been blighted by rain his entire time in Georgia. Thankfully, by the morning, the clouds had rolled off and the tent was soon dry enough to pack up. The map told us we were a mere 240km from Batumi so it would be an easy ride in with one night layover before catching our ferry leaving in the morning. There aren’t so many roads on the map for Georgia. 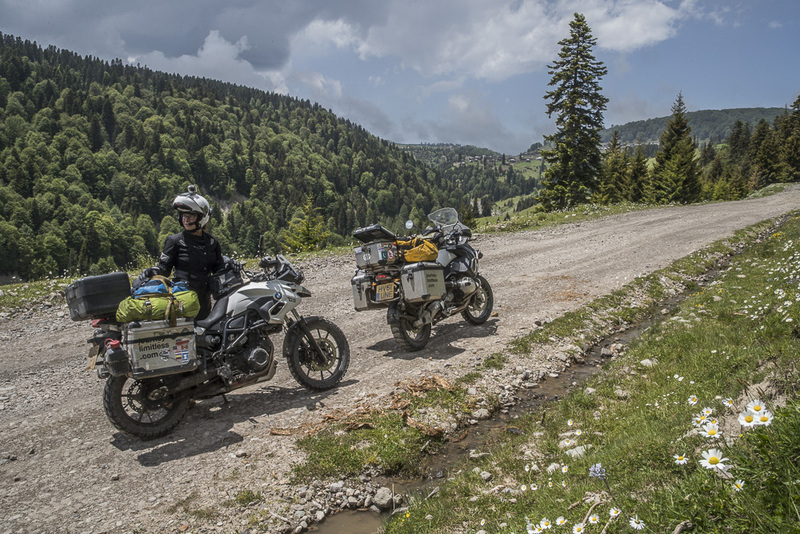 Most head towards Tbilisi and northwards in general, we thought it would be quicker to head along the southern western highway which follows the Turkish border straight to Batumi. The road was fine and we passed the turn off to Turkey and the one towards Tbilisi until we were mostly alone on a small mountain road. We entered a forested set of switchbacks where the tarmac disappeared almost immediately and became similar to rocky hiking trails. This was fine, Alex was now a seasoned biker and able to cope with such irregular roads on turns but soon it started to rain very fine misty rain and just as we thought that this was annoying, the rain turned into hail- pelting us with baked bean sized ice bullets which ricocheted off the helmets with loud bangs and painfully struck us through our clothes and gloves. The road suddenly worsened, with deep, uneven potholes and muddy banks. These were filling rapidly with rain and hailstones and soon it was difficult to tell which were holes and which were just slick mud troughs. Making slow progress uphill, we passed a number of cars who were trying their best to avoid the holes, seemingly stationary, they were simply calculating their next move to navigate along the road. This was definitely easier with only two wheels! 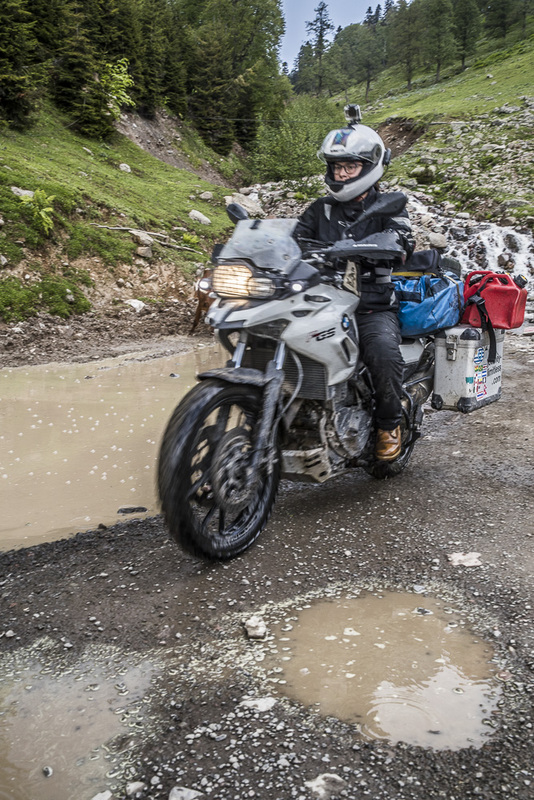 Just as we were soaked, cold and tired from the concentration of the last 30km of muddy rocks and hail storm, the road leveled out and became packed earth and gravel. The sun then burnt through the spent clouds and we saw how truly beautiful this part of the world was. The air was so clean and fresh that our lungs felt bigger with every breath. Rain and potholes make an interesting combo! The road was mostly fine from then on, packed gravel and earth. After a while we passed a tiny village made up of less than ten dwellings. We stopped to buy lunch and found that the shop only stocked frozen food, massive tins of tomatoes or noodles! We settled on a pack of crisps to restore ourselves and some juice. This appeared to be the end of the road as a minibus trundled in, dropped a few people off with massive bags and packages and then picked a few up before turning back the way he came (not the way we’d come from). We followed the bus route and overtook as this well used part of the earth road was severely rutted from rain and mud. The bus was forced to follow the ruts like a train on its rails. We crossed over a crest where major roadworks were dealing with a recent mudslide. Basically there was no road- mud dunes and craters snaked along the crest, culminating in a muddy pond on the bend where a stream ran over from the mountain above. The water was quite deep and we could tell by the rocking of the car passing ahead that the ground below the water was stony. This was going to be a job for Simon as the water was so high on the side of the passing car! He managed to ride both bikes across like a pro and his boots held up their waterproof promise. After another little while, we were faced with a sharp turn in the mud track which disintegrated into smooth rounded, slippery rocks, green with algae and complete with cascading water. Two guys were working on this part of the road, laying over gravel and presumably prepping the surface for further work. This left us with only a metre to pass along (on slippery rocks) and a sharp drop on left with a pretty waterfall. The distance was about 25m along the curve and the thought of walking along was bad enough so instead of wasting time we barreled through. Alex’s bike has an unstable steering compared to Simon’s (compounded further by the leaking fork seals) so she didn’t breathe for the entire 25m as the wheel slid and skidded and switched its way along the riverbed. Time froze as the wheel switched towards the ravine but it was saved at the last minute and Alex made it across, pale and full of adrenaline. After that last challenge, the rest was easy- the road then solidified again, despite the rain getting harder. It gently curved around the bottom of the mountain and just as the rain started to pelt, the road melted back into thin tarmac. It flowed out of the mountain range and joined a busy highway from Turkey as if nothing was more normal. Joining the traffic going northwards, we pulled over soon after to see a famous waterfall and, more importantly, to stop for a cheese pie. This was the most delicious thing Alex had ever eaten… flaky, soft pastry base with a thick, slightly sour cheese. We’d been hoping the rain would abate but it persisted. The restaurant offered us some Georgian wine to restore our health but we still had a little way to go to get to Batumi. We rode through the rain and just as we were soaked through, we pulled over to find our tiny inn for the night. Eventually we found it- an unmarked house on a muddy road, tired of being repaired had just stubbornly been left as bobbly muddy gravel with occasional tarmac ridges. Despite all shabby and plain appearances, the room was comfy and most importantly, the lady of the house had a space for us to attempt to dry our things! It was STILL raining when we left, showered and warm, to buy some dinner. Our ferry was due to leave at lunch the next day so we’d have to wake up early to go and pick up our tickets. Navigating along the port, past casinos, bars and bakeries, we got to a nice supermarket. For the first time in absolutely ages, we were faced with mounds of different salads and vegetables and hams and cheeses. We went a bit wild and bought a dozen tubs of different salads- salmon salad, crab salad, aubergine and walnut, beetroot and cheese… the list was endless and we tried to try a little of everything. Armed with a feast, we came back to our room to eat. It was pleasant with the rain still battering outside, to be dry inside, warm and well fed. Thank goodness we’d had a comfortable night as the next day was full of surprises. We walked to the ferry company’s office and picked up our tickets. It soon transpired that the ferry hadn’t docked the day before as expected so it was delayed. No one knew by how long although they were keen to print our ticket for us and assured us that someone would call with a check in time. Maybe tomorrow? Maybe tonight? Questions were met with helpful responses… Meanwhile, the rain had passed but we had the added complication of the bikes- and our things! Someone was moving into our room so where would we keep all our things in the meantime? After a whole day on uncertainty, we finally received a call at 5pm (5 hours after sailing was due) that we’d be required to load the boat at 1am. Packing our bikes in a light rain, we headed off for a seaside bar to wait until midnight. With the bikes parked just beyond our table, the place didn’t begrudge us staying for 4 hours, nursing a tea and a coca cola! It was such a lovely evening, the feel of a Mediterranean town in the evening. Couples walking along the promenade, enjoying some wine in beachfront restaurants, a dozen languages carrying on the breeze. Before long, it was time to set off for the ferry. Finally we could board the boat, taking an hour to fill our customs forms, waiting amongst the truck drivers who took ages to get their carnets filled. Riding up the gangplank (designed for two wheeled vehicles) was the last challenge, the grips were high and just lying in wait to slip the tyre across to the shear and slippery steel plating. Finally we were anchored on the side of the ferry, strapping holding down our bikes. Laden with our supplies we climbed up to check in and find our bunk. All we wanted was to sleep – it was 3am by now, but the intercom bee-booped that everyone had to congregate in the bar to pass immigration. Queuing up behind sleepy children held on shoulders, wannabe beauty queens (seriously, who wears a cocktail dress and stilettos on a boat at 3am?) and rough looking beer bellied men, we waited for our chance to sit in the cosy bar booth to chat to an immigration official. Duly processed (and bikes- apparently we didn’t need to queue in the original customs queue, that was only for goods) we went to bed. The next 2 days followed a lazy routine of eating, sleeping, drinking and sunning ourselves on the deck. The sunsets were glorious, taking up the whole sky. We lay on the deck to watch the stars, the same which had followed us and comforted us around the world, drinking some Georgian wine (robust flavours, just right for salty sea crossings to Ukraine). The sky was so low in the middle of the sea, it was a bittersweet feeling. Entering Ukraine would feel like a homecoming after the still recent foreign environments of Iran and Pakistan and we weren’t sure we were ready for it all to end. 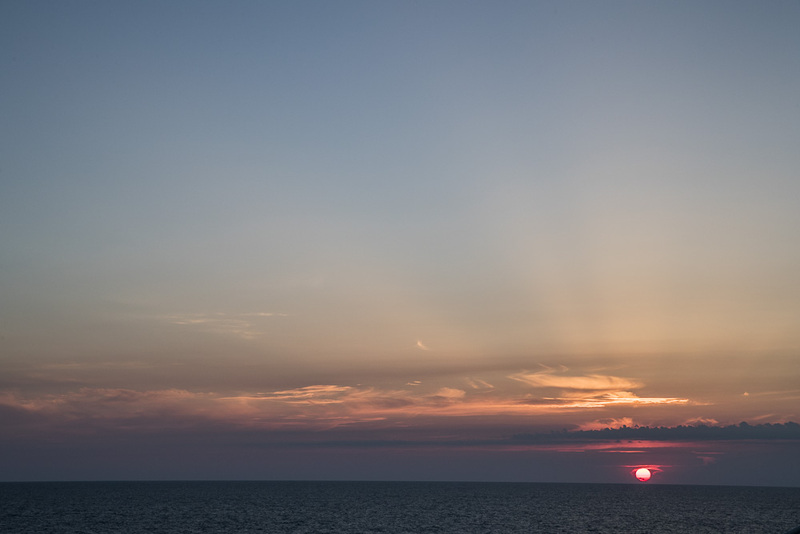 We relished the slow and idle crossing, watching as Crimea rose out of the the horizon on our right, the lack of war planes (the last time Simon had crossed, in 2015, there were demonstrably more Russian fighter planes zooming up to the boat). We shared our boat with cargo drivers, families and sharp guys* turning a profit on Georgian bought American cars being brought to Europe. All too soon we arrived (6am) in Chornomorsk and face the trials and complexities of the bureaucratic customs and immigration systems in the port. After being sent of various wild goose chases around the port, we finally emerged, 6 hours later, allowed to leave. In the chaos of the port maze, Alex had lost the keys to her panniers and now only owned 1 sole key!! We had to forget about it as there was no way we were going to request to be let back INTO the port after making it out in 6 hours! We rode on and the sharp guys from the boat helped us out with finding a company who’d sell us insurance, after a short trip around Odessa we were ready to go. Two hours later, we were riding along the highway towards Kiev, filtering between huge trucks, when Alex noticed one trucker with his hand out from the cab, holding a set of keys. She rode just underneath his cab in the stopped traffic, he dropped the keys into her outstretched hand- amazingly, they were her pannier keys! Good old providence had struck again. *They were actually super nice and helpful, we couldn’t help but admire their savvy loophole opportunist attitude.